Cymre over at bubbles of mischief started a blogging challenge titled "The one that started it all" around two months ago. This was a challenge I wanted to take part in the second I saw it. 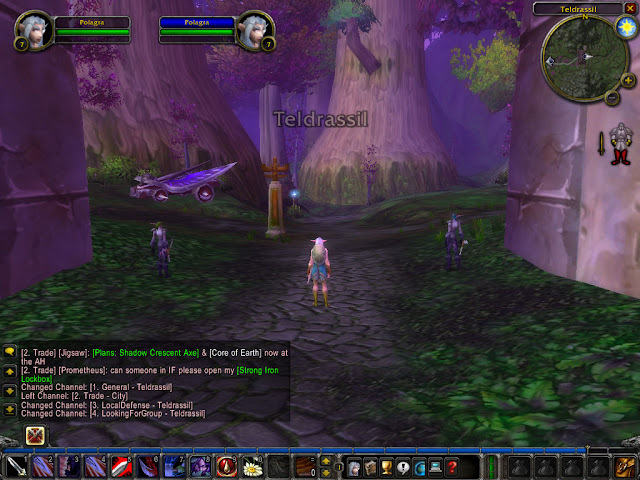 Having played wow for so long, those first few steps of my initial ten day trial are still so clear in my memory despite the amount of time that has passed. I also figured this would be an opportune first blog post. Show us your very first screenshot from the game. Tell us about it, including the date, what you remember about the photo and who was in it with you. Do they still play? Thankfully every time I've gotten a new computer I've backed up the majority of my things, including my screenshots. 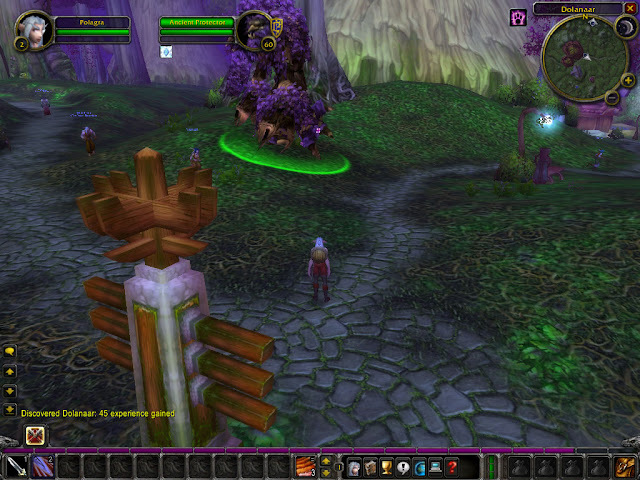 Sadly that means no dates but they were both taken very early in vanilla. My first thought is why am I in Dolanaar at level two? (That part I don't know the answer to but I know why I'd taken the screenshot.) The Ancient Protector had startled me, as he walked towards, through and then passed me. I heard his loud groans as the stomping of his feet echoed through my headset. I was terrified. 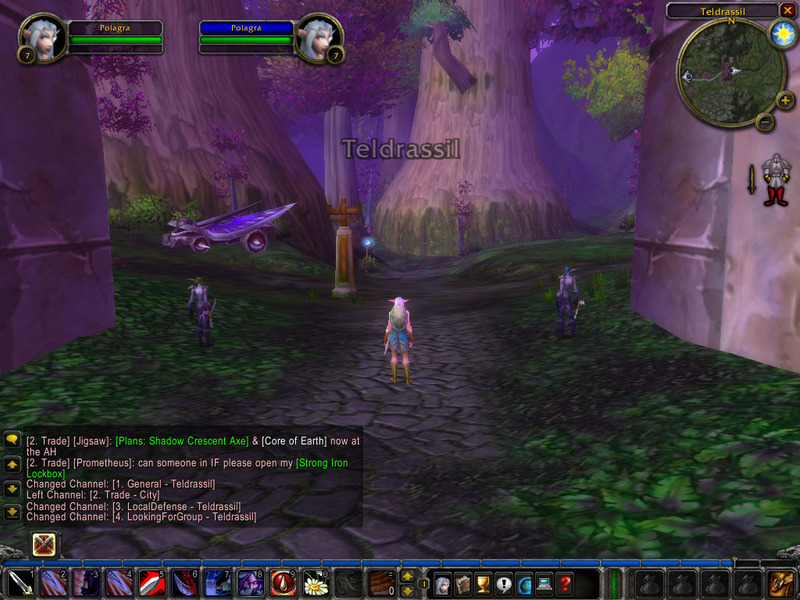 At that point I didn't understand the difference between players, NPC's, Horde or Alliance. All I knew was that he was big and he was making a lot of noise. I stayed out of his way just in case! I've been to Dolanaar recently and he's still roaming around happily protecting the area but he doesn't seem as big or threatening as he used to. How many times can you die by level 7? I find this screenshot hilarious for several reasons. Firstly how important heroic strike obviously was to deserve two slots and secondly the reason I took this screenshot in the first place. In the right hand corner you'll see that my armour is very much damaged. I spent twenty minutes trying to explain to my friend over MSN that there was a yellow man on my screen who wouldn't go away. After spending a while frantically clicking him, trying to drag him off of my screen I managed to take a screeenshot to send to him over MSN. He taught me how to repair my armour and I found out how to rotate my camera to boot! LOL, love the description of the 2nd shot. Thanks for joining in the meme. Thanks a bunch for popping in. I've always loved your blog <3 I've wanted to start my own for a while now. New month and with the Newbie blogger initiative that just started I figured why not! Congrats on new blog it looks awesome!